Throughout the UK the Wetland Bird Survey counts are made by volunteer bird-watchers on a co-ordinated, one-day count each month. In recent years the numbers of duck and waders have decreased on the Mersey in line with other west coast sites, though the Mersey numbers appear to have declined more than on the Dee Estuary. The reason for these declines is not certain but it could be that birds are staying further North or East with the run of milder winters we have experienced in the last decade. Black-tailed godwits on the River Mersey. Graham Thomason started doing counts on the Mersey Estuary with Ron Allen in 1954 and took over as the Mersey co-ordinator for the Duck and Wader Counts in 1970. During this period the counts were managed by The Wildfowl Trust (now the Wildfowl and Wetlands Trust). Later the organisation and management of the counts was taken over by the British Trust for Ornithology. Graham finally retired from counting in 2012 and a new co-ordinator Dermot Smith was appointed. 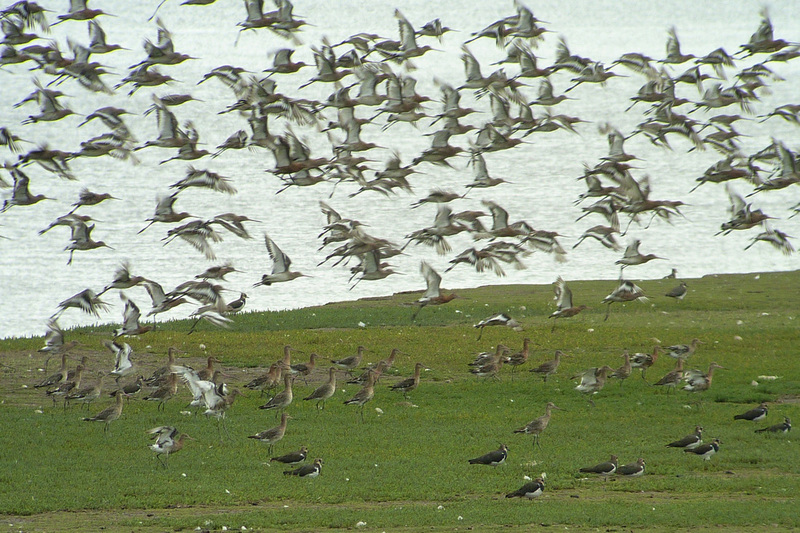 A flock of dunlins join the high tide roost on Hale Marsh. 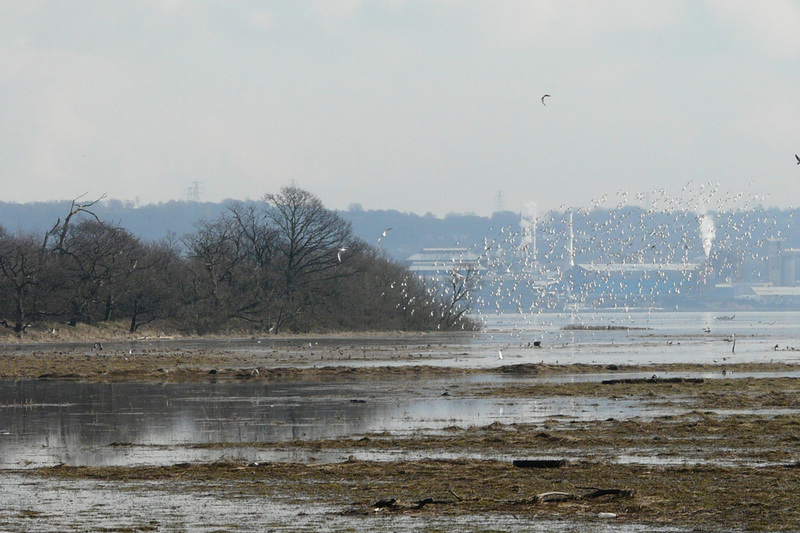 It is important that the numbers of birds using the estuary are known: not only the regular wintering birds but also the migrant waders and ducks which use the estuary as a stop-over on migration. Regular monitoring shows up drops in numbers of certain species and helps the national bodies to ensure, wherever possible, the declines are reversed. Unfortunately, for several years, shortage of counters has meant that some counts, in particular the moulting shelduck and Canada geese flocks from late June to August, have been missed or under-recorded. Additional counters are required for several sites on the Mersey Estuary. Counters are sometimes admitted to parts of the estuary which are under-recorded due to lack of access and are given opportunities to find out more about what is really happening on our local estuary. A basic knowledge of duck and wader identification would be useful and at some sites a telescope is essential. Teal gathering on the incoming tide.